Microsoft Image Composite Editor (Microsoft ICE) is a simple-to-use, free application for making panorama images out of photographs and video files. You can use it to easily create a panorama out of the series of stitched overlapping shots taken from a single point with a photo or video camera. The panorama made with Microsoft ICE will combine all of the source images in full resolution. It can be saved in a variety of available formats — from JPEG and TIFF to HD View and Silverlight DeepZoom. You can also publish the panorama on the Microsoft Photosynth website directly from the software. - Stitching individual shots into panoramas automatically. - Flat, spherical and cylindrical panoramic projections. - Support for various types of camera movement. - Stitching panoramas from video. - Special exposure blending algorithm. - Ability to remove lens vignettes. - Automated cropping to a maximum image square. - Virtually unlimited image size. - Wide variety of supported image formats. 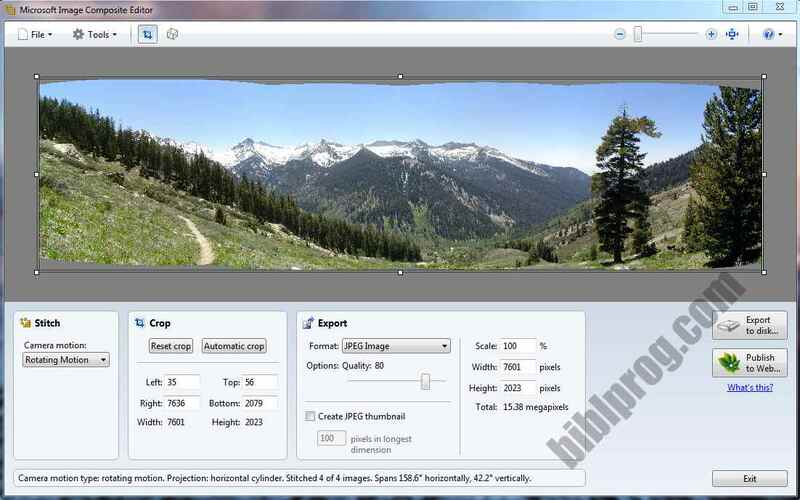 - Ability to publish panoramas on Microsoft Photosynth.